Mrs. Lorie McClain is happy to be returning for her fifth year at Divine Wisdom Catholic Academy in Douglaston. 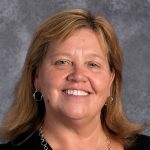 She will continue to be the homeroom teacher for 7-2 and continue to teach 7th and 8th grade Science. Mrs. McClain received her BA in Secondary Education from Queens College and her MS degree from the New School for Social Research. She started her teaching career in a private high school in Brooklyn. While raising her family, she did substitute teaching in NYC middle schools throughout Queens. Mrs. McClain also taught courses at Hunter College in the Department of Curriculum and Teaching, while working for years developing educational programs for schools and community. In her spare time, Mrs. McClain loves spending time with family and friends, visiting the beach as much as she can, but does also enjoy a good rainy day! Her goal in teaching is to instill in her students a love for learning. Mrs. McClain loves quotes and one of her favorites is ‘a smart person does not have all the answers, but a smart person knows where to look for them’.